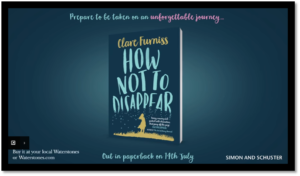 Clare Furniss | Watch the brand new How Not To Disappear trailer! Watch the brand new How Not To Disappear trailer! The paperback of How Not To Disappear will be in bookstores on 14th July! If you’d like to find out a bit more about it click here to watch the beautiful brand new trailer, unveiled today. Hope you enjoy it! And if it does whet your appetite, How Not To Disappear is available for preorder from Waterstones.